Last night Bushiroad announced the upcoming release of Cardfight!! 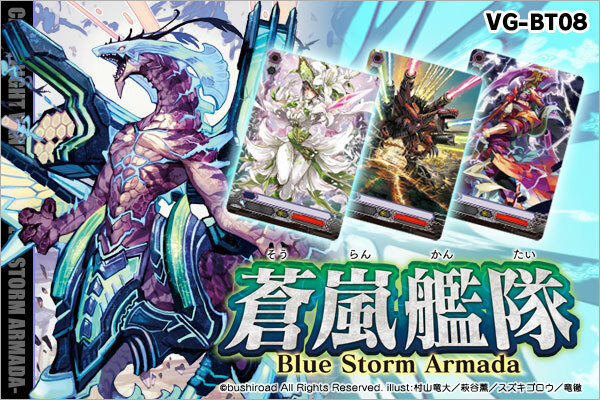 Vanguard's eighth main booster set and eleventh set overall, Blue Storm Armada. The set will feature renewed support for Neo Nectar, Dimension Police, Narukami, Tachikaze, Great Nature and Aqua Force, the last of which will be introduced in the set's accompanying trial deck, TD07: Descendents of the Marine Emperor. The set has already found widespread acceptance in the Japanese blogosphere and across twitter. Blue Storm Armada is geared for a domestic release on September 22nd, 2012. There is no current information on when its English release will arrive, but based on previous statements it is currently believed that BT03-04 may take priority, as BT01-02 did against BT06 and EB03.